William Koster Jr. was born on 12 January 1887 in Carroll County, Iowa. He married Matilda P. Grabner, on 6 February 1912 in Breda, Carroll County, Iowa. He was also known as Herman William. He was registered for the draft on 5 June 1917 Carroll County, Iowa. He appeared on the census of 1920 in Carroll County, Iowa; Joseph (31) is living on Main Street in Breda, with his wife Sophie (32) and daughter Lucile (9/12). Also living with the family is Joseph's father, William Koster (69). William is a widower who emigrated from Germany and became a citizen in 1874. All of Joseph's family was born in Iowa, with both Joseph and Sophie's parents born in Germany. He appeared on the census of 1930 in Carroll County, Iowa; William (43) is enumerated on a farm in Wheatland Township with his wife Mathilda (39) and children William (17), Walter (14), Velma (12), Kermit (10), Donald (8), Maxine (6), Doyle (3 4/12) and Roger (1 1/12). Also living with the family is Fred A. Mueller, 25, as a laborer. All of the family was born in Iowa. They own their farm and have a radio. He died on 14 April 1965 at age 78. He was buried in St. Bernard Catholic Cemetery, Breda, Carroll County, Iowa . Mathila P. Grabner, daughter of Joseph Nicholas Grabner and Margaret Stemper, was born 10 July 1890 in Breda, Carroll County, Iowa. . . . . 1. William Joseph Koster, born 23 December 1912. He married Loretta Woedehoff. He died on 12 December 1988 at age 75.
. . . . 2. Walter Bernard Koster, born 8 November 1915. He married Viola C. Reising. He died 11 November 2006 in Carroll, Carroll County, Iowa at age 91.
. . . . 3. Velma Josephine Koster, born on 12 November 1917. She married Robert J. Blum. She married Robert Bromert. She died 26 January 2003 in Harlan, Shelby County, Iowa at age 85.
. . . . 4. Kermit Edward Koster, born 27 October 1919. He married Elsie Rose Wolterman. He died on 30 November 2006 Sioux City, Woodbury County, Iowa. . . . . 5. Donald C. Koster, born on 18 March 1922. He married Delores Heinrichs. He died 13 February 1996.
. . . . 7. Doyle J. Koster, born on 12 June 1926. He married Bernice Broich. He died on 9 November 1984 in Fonda, Pocahontas County, Iowa. Matilda died 4 February 1983 in Breda, Carroll County, Iowa. She was buried in St. Bernard Catholic Cemetery, Breda, Carroll County, Iowa . Joseph Koster was born on 17 October 1888 in Carroll County, Iowa. He married Sophia Katherine Schulte on 2 April 1918 in St. Bernard Catholic Church, Breda, Carroll County, Iowa. He was also known as Francis Joseph. He appeared on the census of 1920 in Breda, Carroll County, Iowa; Joseph (31) is enumerated on Main Street in Breda with his wife Sophie (22) and children Lucille (9/12) and Joseph's father William (69). William was born in Germany and the rest of the family in Iowa. Joseph lists Germany as the birthplace of both parents and Sophia lists Germany as the birthplace of her father and Iowa for her mother. Joseph is a farmer. William is a widower who immigrated in an unknown year, but he lists his naturalization date as 1872. They own their home with no mortgage. He appeared on the census of 1930 in Breda, Carroll County, Iowa; Joseph (41) is enumerated in Breda with his wife Sophia (42) and children Lucille (10), Herbert (9), Agnes (7), Esther (2) and Linus (1 4/12). All of the family was born in Iowa. They own their home and have a radio. He died on 1 October 1965 at age 76. He was buried in St. Bernard Catholic Cemetery, Breda, Carroll County, Iowa . Sophia Katherine Schulte, daughter of Clemens Schulte Sr. and Maria Elizabeth Determan, was born 20 May 1887 in Iowa. . . . . 1. Lucille Mary Koster, born 28 June 1920 in Iowa. She married Leo Felskes. She died 4 March 2002.
. . . . 2. Herbert Clemons Koster, born on 28 June 1920 in Iowa. He married Lillian Meyers. He died 12 May 1962 in Carroll County, Iowa at age 39.
. . . . 3. Andrew William Koster, born on 9 October 1921 in Iowa. He died on 4 December 1922 in Iowa. . . . . 4. Agnes Anna Koster, born on 20 January 1923 in Iowa. She married Linus J. Sievers. She died 4 February 1991 at age 68. Sophia died 11 June 1977 at age 90. She was buried in St. Bernard Catholic Cemetery, Breda, Carroll County, Iowa . Anna Maria Koster was born on 1 February 1891 in Breda, Carroll County, Iowa. She married Anthony J. Knobbe on 19 September 1917 at Breda, Carroll County, Iowa. She appeared on the census of 1920 in Carroll County, Iowa; Anna (26) is enumerated on a farm in Pleasant Valley Township with her husband Anton (27) and daughter Corinne (1). All of the family was born in Iowa and both Anton and Anna list Germany as the birthplace for mother and father. They are renting. Anna died on 7 October 1927 at age 36. She was buried at St. Mary Catholic Cemetery, Willey, Carroll County, Iowa. Anthony J. Knobbe, son of Clemons John Knobbe Sr. and Marie Teresa Wempe, was born 27 July 1892 in Carroll County, Iowa. . . . . 1. Corrine Clara Knobbe, born on 6 March 1919. She married Lawrence Hansman. She died on 3 April 1979 at age 60.
. . . . 2. Carole M. Knobbe, born on 25 June 1920. She married Leo F. Snyder. She died 7 January 2000 in Carroll, Iowa. . . . . 3. Clinton Henry Knobbe. was born on 10 February 1922. He married Roceal M. Brincks. He died on 10 January 2000 at age 77.
. . . . 4. Cletus Rose Knobbe, born on 2 April 1925. She married Virgil Tannehill. She died on 27 January 1977 at age 51.
. . . . 5. Thurlow, was a small child when he died. After his first wife died, he married Marie Haberl, daughter of Martin Haberl and Margaret Bauer. They has two more children, Marie Antoninette and Patricia Knobbe. Anthony Knobbe died 27 June 1953, Carroll, Carroll County, Iowa. He was buried at St. Mary Catholic Cemetery, Willey, Carroll County, Iowa. Clemens Koster was born on 21 December 1893 in Breda, Carroll County, Iowa. 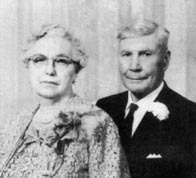 He married Hazel Mary Van Erdewyk on 19 September 1917 Breda, Carroll County, Iowa. He appeared on the census of 1920 in Carroll County, Iowa; Clemens (26) is enumerated on a farm in Wheatland Township with his wife Hazel M. (22) and son Floyd F. (1 6/12). All of the family was born in Iowa. Clemens lists Germany as the birthplace of his father and Iowa for his mother. Hazel lists Holland as the birthplace of her father and Iowa for her mother. They own their farm with no mortgage. He appeared on the census of 1930 in Carroll County, Iowa; Clem (36) is enumerated on a farm in Wheatland Township with his wife Hazel (33) and children Floyd (11), Pearl (10), Edgar (8), Elaine (7), Dale (5), Alma (4), Anita (2 4/12) and Urban (8/12). Also living with the family is Fred Van Erdewyk, a lodger/laborer, 22 years old and born in Iowa. All of the family was born in Iowa. They own their farm and have a radio. Clemens died on 11 February 1971 in Iowa at age 77. He was buried in St. Bernard Catholic Cemetery, Breda, Carroll County, Iowa . Hazel Mary Van Erdewyk, daughter of Frank Van Erdewyk and Gertrude Salimens, was born 16 January 1897 in Burt Kossuth County, Iowa. . . . . 2. Pearl S. Koster, born on 10 March 1920 in Breda, Carroll County, Iowa. She married Irvin B. Staiert. . . . . 4. Elaine Edna Koster, born 8 February 1923 at Breda, Carroll County, Iowa . She married Othmar J. Bierl. She died 29 March 2006 at Carroll, Carroll County , Iowa . . . . . 9. Helen M. Koster, born on 8 April 1931. She married Norman Bertrand. She died on 1 November 1976 at age 45. She was buried in St. Bernard Catholic Cemetery, Breda, Carroll County, Iowa . . . . . 12. Margaret May Koster, born on 11 June 1936. She died on 20 July 1936. She was buried in St. Bernard Catholic Cemetery, Breda, Carroll County, Iowa . . . . . 15. Leo Koster, born on 8 September 1942. He died on 8 September 1942. He was buried in St. Bernard Catholic Cemetery, Breda, Carroll County, Iowa . Hazel died 28 February 1988 in Carroll, Carroll County, Iowa, at age 91. She was buried in St. Bernard Catholic Cemetery, Breda, Carroll County, Iowa . Clara Koster was born on 6 January 1896 in Breda, Carroll County, Iowa. She married John William Knobbe on 19 September 1916 at Breda, Carroll County, Iowa. She appeared on the census of 1920 in Carroll County, Iowa; Clara (24) is enumerated on a farm in Pleasant Valley Township with her husband John W. Knobbe (29) and children "Merll" (1) and Edwin (7/12). All of the family was born in Iowa and both John and Clara list father and mother born in Germany. They are renting. She appeared on the census of 1930 in Carroll County, Iowa; Clara (34) is enumerated on a farm in Pleasant Valley Township with her husband J.W. Knobbe (39) and children Merlin A. (12), Edwin C. (10), Florence M. (9), Jacqueline W. (7), Robert B. (4 11/12), Roy H. (2 10/12) and Lee C. (5/12). Also living with the family is Carl Ott, a lodger/servant born in Iowa and 23 years old. All of the family was born in Iowa. They own their farm and have a radio. Clara died on 3 March 1987 at age 91. She was buried 6 March 1987, at St. Mary’s Catholic Cemetery, Willey, Carroll County, Iowa. John William Knobbe, son of Clemons John Knobbe Sr. and Marie Teresa Wempe, was born 6 January 1896 in Carroll County, Iowa..
. . . . 1. Merlin Aanthony Knobbe, born on 24 January 1918 in Willey, Carroll County, Iowa. He married Cyrilla M. Golwitzer. He died on 19 June 1992 in Waukegan, Lake County, Illinois, at age 74.
. . . . 2. Edward Clement Knobbe, born on 18 June 1919 in Willey, Carroll County, Iowa. He married Norma Marietta Willenborg. He died on 14 April 1976 in Carroll, Carroll County, Iowa, at age 56.
. . . . 3. Florence M. Knobbe, born on 9 February 1921 in Willey, Carroll County, Iowa. She married Edwin Huegerich. She died on 21 January 1994 in Carroll, Carroll County, Iowa, at age 72.
. . . . 4. Jacqueline W. Knobbe, born on 1 May 1922 in Willey, Carroll County, Iowa. She married Dominic Sibenaller. She died on 11 August 1999 in Carroll, Carroll County, Iowa, at age 77.
. . . . 5. Robert B. Knobbe, born on 20 May 1925 in Willey, Carroll County, Iowa. He married Dorothy Blum. He died 24 June 2003 in Carroll, Carroll County, Iowa at age 78.
. . . . 6. Roy Henry Knobbe, born on 13 May 1927 in Willey, Carroll County, Iowa. He married Helen F. Klocke. He died on 27 August 1978 in Carroll, Carroll County, Iowa, at age 51.
. . . . 7. Lee Clem Knobbe, born on 15 November 1929 in Willey, Carroll County, Iowa. He married Jean Willenborg. He died on 28 September 2000 in Guthrie Center, Guthrie County, Iowa, at age 70.
. . . . 8. Gerald G. Knobbe, born on 5 February 1934 in Carroll County, Iowa.. He died on 4 July 1964 in St. Louis, St. Louis County, Missouri at age 30.
. . . . 9. William Knobbe, born on 3 December 1935. He died on 20 December 1935. John Knobbe died on 30 August 1961, Carroll, Carroll County, Iowa, at age 71. He was buried 4 September 1961 at St. Mary Catholic Cemetery, Willey, Carroll County, Iowa.